Home | Blog | Does productivity necessarily increase with city size? One of the central claims made for the importance of city size is that it promotes higher productivity. Several studies, of a cross sectional nature, have been conducted to estimate how productivity increases with city size. The size of this effect is however modest: typically, a doubling of city size is estimated to be associated with an increase in the level of productivity of between 2-5 percent (see the discussion in Ahrend et al, 2014). For an elasticity of 2 percent, this sort of analysis implies that London would (should) have a productivity level some 10 percent higher than in a city of 50,000; an elasticity of 4 percent, a productivity level some 20 percent higher. The evidence for the UK, however, suggests that the city size argument should be viewed with caution. Using the estimates of labour productivity for some 85 British cities defined in terms of travel to work areas, the relationship between city size and labour productivity (GVA per employed worker) is not statistically significant, even if London is included (Figure 1). London, as the largest city also has the highest labour productivity. However, the next largest cities – Manchester, Birmingham, Glasgow, Sheffield, Newcastle – all have much lower productivity, in fact below the national average. 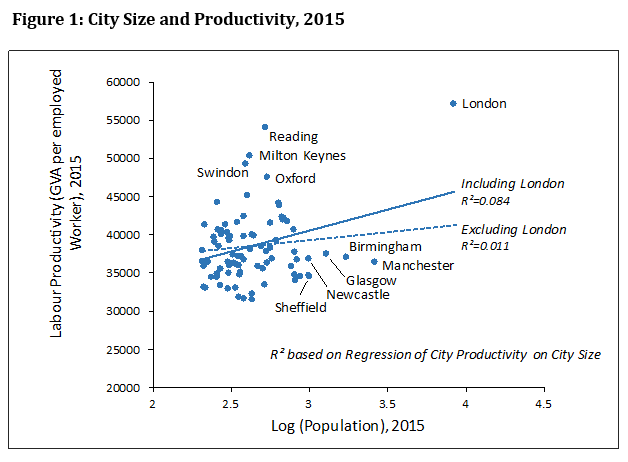 Some of the highest productivity cities after London – such as Reading, Milton Keynes, Swindon and Oxford – are all much smaller in size. Clearly, other factors than size alone are at work in influencing a city’s labour productivity. Advocates of the ‘bigger is better’ argument typically make reference to Zipf’s law of city sizes, sometimes known as the rank-size rule. This rule states that the population of a city is inversely proportional to its rank. If the rule held exactly, then the second largest city in a country would have half the population of the biggest city; the third largest city would have one third the population, and so on. Put another way, according to Zifp’s law, if we plot the ranks of a country’s cities against their sizes on a graph, using logarithmic scales, then the line relating rank to population is downward sloping, with a slope of -1. Appealing to this law, Overman and Rice (2008) argue that while medium sized cities in England are, roughly speaking, about the size that Zipf’s law would predict given the size of London, the largest city, the major second-tier cities in the north of the country all lie below the Zipf line and hence are smaller than would be predicted. Can Zipf’s Law be successfully applied in the UK? The empirical evidence for Zipf’s Law is highly varied internationally (see Brakman, Garretsen and van Marrewijk, 2009, pp. 299-309). Further, there is no generally accepted theoretical economic explanation of Zipf’s law, nor does the ‘law’ tell us how far a city can fall below the rank-size rule line before it is deemed to be ‘too small’, or how this will affect its economic performance. Perhaps more seriously, it is indeed the case that Zipf’s law does not in fact hold for a national urban political economic system of the sort that characterises the UK. Zipf’s law is not quite as neat in other countries as it is in the United States, but it still seems to hold in most places, if you make one modification: many countries, for example, France and the United Kingdom, have a single ‘primate city’ that is much larger than a line drawn through the distribution of other cities would lead you to expect. These primate cities are typically political capitals: it is easy to imagine that they are essentially different creatures from the rest of the urban system. (Krugman, op cit, p. 41, emphases added). What makes a capital city different? At the same time, to the extent that a capital city itself is a major global centre, its development is likely to reflect the benefits of that role, and be less linked to (even significantly decoupled from) the rest of its national urban system. These observations suggest that in such cases, it make little real economic sense to argue that second tier cities below the primate capital city are ‘too small’ relative to what the rank-size rule would predict, since the size of the capital itself has to do with national political and administrative roles and factors in addition to the purely economic. This surely is the case with London. As the nation’s capital, it has long benefited from being the political centre, containing the main organs of Government policy-making, the nation’s main financial institutions and market, and a large number of headquarters of major corporations. This has meant that it attracts much of the talent and skilled of the country’s workforce. In recent years, it has also benefited from a disproportionate share of major infrastructural investment. Under these circumstances, it is hardly surprising that it has a high productivity. Yet the high productivity of several much smaller cities suggests that size and agglomeration are not everything. This is not to say that agglomeration is irrelevant – clearly all cites of whatever size benefit to a greater or lesser extent from the local concentration and proximity of workers, firms and infrastructures. But aiming to improve the productivity of Britain’s northern cities by substantially expanding their size, or seeking to merge them into a single very large city, may neither be necessary nor sufficient as a strategy. Ron Martin is Professor of Economic Geography in the University of Cambridge. 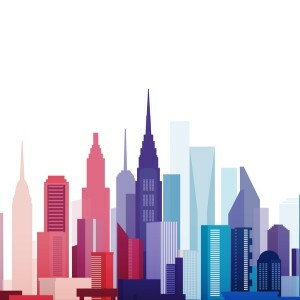 He leads an ESRC-funded project on City Economic Evolutions (ES/N006135/1) with other colleagues in Cambridge, the Universities of Southampton, Newcastle and Aston and Cambridge Econometrics. The city data used in this note were constructed as part of that project.